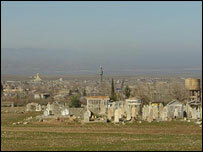 Halabja is the Kurdish town where Saddam Hussein used chemical weapons in an effort to crush opponents. In the final part of his journey through Kurdistan, Alastair Leithead visits the region's most notorious town. First light in the mountains of Kurdistan is a very special time - and it was good to feel the crunch of snow under my feet and breathe the fresh morning air high up on the ridge. 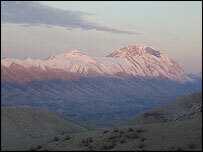 In the valley was Sulaymaniyah, the rays of sun taking longer to cast an orange hue on the highest buildings. We started early for the drive to Halabja through some of the most beautiful scenery on this journey into northern Iraq. Amid the rich greens and the huge blue skies, shadows brought out details in the rolling hills, laid out below the snow-topped peaks. The drive through the fertile valley into Halabja was breathtaking, but at the back of my mind was the knowledge of what happened here in March 1988. It is perhaps the best-known Kurdish town - the place where Saddam Hussein used chemical weapons on his opponents with devastating results. A statue looks over the memorial graveyard - the name of each of the 5,000 victims written neatly in Kurdish on row after row of regimented headstones. A further 10,000 people were injured by the poison gases that rained down on the town. The commemorative museum has a gruesome display of photographs taken in the aftermath of the attack. Close-up pictures of the dead lying as they fell in the streets - men, women and children. 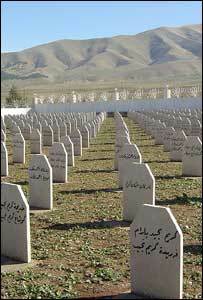 If anyone has earned the right to make their voices heard on the future of Kurdistan it is the people of Halabja. Yerevan had been our translator for the trip and he was born in the town. For once I asked him to forget about being balanced and translating what he hears, but to tell me his feelings, his thoughts. Yerevan was eight years old when his parents gathered their things and headed for the mountains when the bombs started to fall. They lived in a cave for a week, and he described the sickly smell of apples wafting up from the town below. They fled to Iran as his father was known as an outspoken critic of the government and therefore a target. Now he has strong views on the future. "Yes, I want us to be independent," he told me as we stood at the peace monument, another symbol of remembrance on the hill overlooking Halabja. "We cannot trust anyone in Baghdad whoever they are. We are Kurdish, this is Kurdistan and it has been for centuries. We must remain separate." And all the people we spoke to on the streets said the same, that independence is what they want and they are scared and paranoid of the Arabs. But then who can blame them? If there is one thing to say from this all too brief journey around northern Iraq it is that people up here are very different in culture, language, thinking and in a landscape at odds with the rest of the country. Like many of the countries that were colonised, they owe their isolation and their current problems to politicians drawing lines on maps in the past. The Kurdish question is a big question for the coalition's diplomats and the embryonic new Iraqi authority to grapple with. The Kurds have suffered from all too many broken promises before, and now see this as their chance to stand by what they believe in. They will be careful with their compromises. "If anyone deserves to be listened to it's the people of Halabja"